The Area Agency on Aging District 7 (AAA7) is looking for community leaders to assist with facilitating its Chronic Disease and Diabetes Self-Management Programs. Interested in being trained to help your community better manage their chronic disease conditions? The Area Agency on Aging District 7 (AAA7) is looking for community leaders to assist with facilitating its Chronic Disease and Diabetes Self-Management Programs. Community leaders/coaches will continue to support the classes in their individual communities after they complete training through the AAA7. An upcoming training is scheduled in West Union (Adams County) starting on February 19th for those individuals who are interested. The AAA7 covers ten counties in southern Ohio, including Adams, Brown, Gallia, Highland, Jackson, Lawrence, Pike, Ross, Scioto and Vinton. Self-management programs for people with chronic conditions are designed to help those with chronic diseases, such as high blood pressure, asthma, arthritis and diabetes, learn to manage their conditions and take control of their health. The Chronic Disease Self-Management Program (CDSMP) and Diabetes Self-Management Program (DSMP) was created at Stanford University and are proven community initiatives that provide health benefits and promote disease prevention. CDSMP and DSMP are six-session workshops that meet once a week where participants learn how to minimize symptoms such as fatigue, pain, stress and depression. The programs teach skills for communication, managing medications, better breathing, and how to design your own self-management program. The programs focus on the participants’ role in managing their illnesses and building their confidence so that they can be successful in adopting healthier behaviors. Workshops are highly interactive, where workshop leaders, as well as group members, provide support while learning new techniques for dealing with symptoms. To expand this evidence-based program, the AAA7 is looking for individuals to become trained community coaches. These community leaders are volunteers who typically have chronic conditions themselves and conduct workshops using the prepared curriculum. They complete a training program where they are mentored by master trainers. An essential element to these six-session workshops is that they are held in community-based settings, such as senior centers, faith-based organizations and libraries, with most led by certified and trained community coaches rather than medical professionals. The upcoming Community Coaches Training will take place in West Union on February 19, 21, 25 and 26. 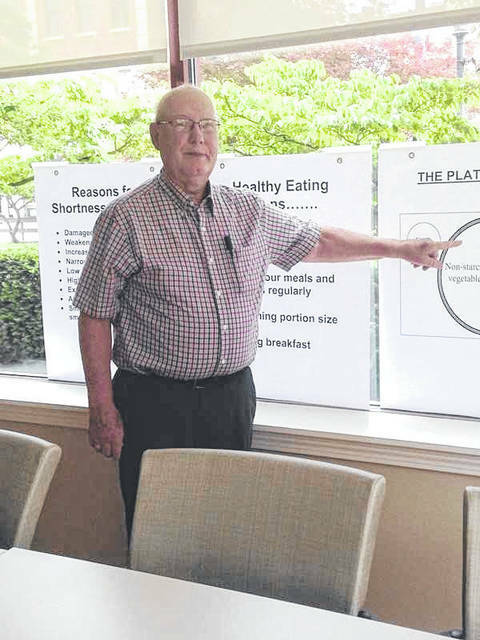 The training will take place from 9 a.m. until 4 p.m. each day at the Adams County Senior Center, located at 10835 State Route 41 in West Union. Those who are interested must attend all four days in order to be certified to lead the programs. Attendees will be provided with in-depth information needed to conduct the workshops and receive the materials at no cost. As all workshops are designed to be facilitated by two trainers, it is strongly suggested that you bring someone with you that you prefer to lead the classes with you. A pre-screening is required of all applicants who express an interest in serving as a community coach. For more information about registering for the training, please call Carla Cox at 1-800-582-7277, extension 284. Those interested in learning more can call toll-free at 1-800-582-7277 (TTY: 711). Here, individuals can speak directly with a specially-trained Resource Specialist who will assist them with information surrounding the programs and services that are available to best serve their needs. The Agency also offers an in-home assessment at no cost for those who are interested in learning more. Information is also available on www.aaa7.org, or the Agency can be contacted through e-mail at info@aaa7.org. The Agency also has a Facebook page located at www.facebook.com/AreaAgencyOnAgingDistrict7.